Today’s video is interesting because my Street Hunt takes place in a completely different environment to what you are used to seeing until now. This Street Photography video has been shot in Athens, the capital of Greece. A city with a great and amazing history, a city that is full of millions of interesting people! In this Street Hunt I walk from Zografou all the way down to Gazi in the centre of Athens. It is a long walk through different versions of Athens. 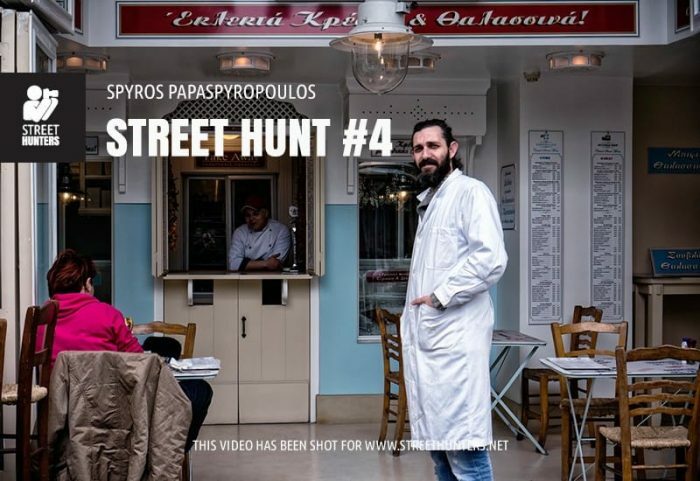 You will see me take photos in the cosmopolitan Panepistimiou avenue, shoot street in some other parts of the Greek capital that are more dodgy, I will speak to amazing characters to ask for Street Portraits and I will take a photo of a Red Door. In the video I use my APS-C Sony NEX-6 with various settings, depending on the situation. The lens I use is a 35mm, equivalent to 50mm full frame. I love this lens because it is perfect for nearly any situation. So, stick around, sit down, relax, grab a bowl of pop corn, or whatever makes you feel comfortable and enjoy this months busy, noisy, versatile Street Hunt! Enjoyed the wander mate…cool to hear you too : ) some great opportunities… found myself saying ‘click click’ in my head as I saw them approaching… framing up the shots. Good stuff mate! Hello there Steve! Great to see you stopped by and dropped a line 🙂 I really appreciate it mate! I have seen the video many times since I made it and felt that I missed quite a few shots, but as the great Martin Parr keeps saying, I can’t be in more than one place at the same time and the same goes for my vision. It can’t be in more than one place at the same time. Next time I am in the big city, I will slow down and take my time. I will try and focus more on the area I am in and not to cover more ground. However, I had a great time shooting this! Cheers for your comment! Hi Spyros, Once again a great video just like the previous ones. I laughed out loud when you said to the guy selling cigarettes that you didn’t speak Greek! Also, the big guy in the green outfit would have been too scary for me to ask for a photograph, Bravo!! Hello Ian and thanks a bunch for watching the Street Hunt! I am glad you enjoyed it! Yes, I told the guy I don’t speak Greek to get back to my Street Photography a.s.a.p. I couldn’t waste my time on cigarettes and stuff, plus I don’t smoke! As for the big guy in the green suit, he wasn’t that big. I was 1 foot taller than him and he was actually a very calm person. He was cool with me taking his photos, he was as relaxed as a person can be. Again, thanks for watching Ian!